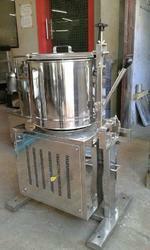 Leading Manufacturer of chocolate grinder (chocolate melangeur ) from Coimbatore. We are manufacturing chocolate grinding machine and we export more than 100 grinders to our customers for the purpose of grinding chocolates. Chocolate Grinder (Chocolate Melangeur) is available in various capacities like 5ltr, 10ltr, 15ltr, 20ltr, 30ltr 40ltr. Some of our customers are Marou Chocolate in Vietnam. Hogarth Chocolate in Newzeland. Chocolaterie Laia in France. Forever Cacao in UK. Lucocoa Chocolate in UK. LA Rose Noire in Philippianes. Agapey Chocolate Factory in Barbados. Ruket Chocolate Srls in Italy. Willie's Cacao Ltd in UK. Chocolate Line Factory in Belgium. Belvie Chocolate in Vietnam. Chocolaterie Gauthier in Belgium. CV. nDalem Mulya Mandiri in Indonesia. Ca Cao Nong Lam Co Ltd in Vietnam. Panelite SA in Belgium. Mati Ltd in Taiwan. Jean-Christophe HUBERT in Belgium. Chocolatoa in Belgium. Atypic in Victoria Australia. Grupo Terrasana SAS in Colombia.